Following the agreement reached between Iran and international mediators in Lausanne on April 2, political commentators and industry insiders are beginning to speculate on when oil sanctions against Tehran will be lifted and what effect this will have on the global oil market. 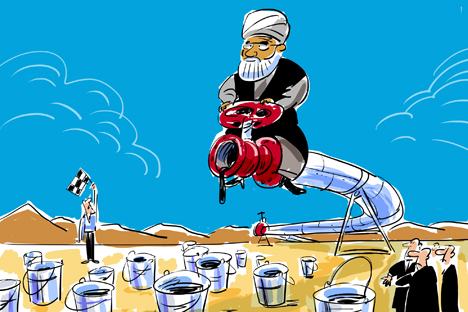 But does Russia have anything to fear from the return of Iranian oil to the marketplace? With relations between Iran and the world’s leading nations set for a thaw in the wake of the landmark agreement reached in talks on Tehran’s nuclear program in Switzerland last week, commentators are already turning to speculation on when Western sanctions against Iran might be relaxed and what the implications will be for global trade. For the Russian economy the lifting of sanctions against Iran could lead to significant adverse consequences, particularly for the oil and gas industry. This will be primarily due not to direct competition with Iranian oil, but rather to the impact of this situation on world prices. The reduction in oil exports from Iran under the influence of sanctions was not so large in absolute terms. The Iranians lost about 1 million barrels, or about 50 million tons, per day of oil exports due to the EU and U.S. sanctions on Iranian oil imposed in 2012 and other restrictive measures. Half of those losses were caused by the refusal of European countries to buy Iranian oil, another half by a decrease in purchases by Asian consumers. The Asia-Pacific region was the main destination for Iranian oil before the embargo (nearly 70 percent of sales), and it is even more so now (about 95 percent of sales). What is more, Asians cannot give up Iranian oil even under sanctions, despite all their loyalty to the West. Oil demand in the Asia-Pacific region has grown steadily, and it will easily be enough to absorb additional supplies from both Iran and Russia. In Europe, the situation is more complicated, but still, given the volume of supplies of oil and petroleum products from Russia to Europe (about 250 million tons per year), the largest Iranian supplies to the market (about 25 million tons per year) will not provide significant replacement potential. In addition, it was not Russia that replaced the supply of Iranian oil, but other Middle Eastern countries – Libya, Iraq and Saudi Arabia. Accordingly, it is rather they that will have to worry, especially since it is they that will need to maintain the total OPEC production quota. On the whole, Iranian oil is comparable to Russian oil in terms of costs of production – in both cases, the costs usually do not exceed $20-25 per barrel. However, the Russian producers have now to develop increasingly complex fields that push the price up to $30 per barrel or even more. Over time, this situation will become more complicated. However, a more dangerous rival in this context appears to be Iraq, which has much greater potential to increase production in the long run than most other Middle Eastern countries, including Iran. As for gas, Iran cannot yet be regarded as a rival to Russia, since Tehran does not export the fuel, barring a small amount of supplies to Turkey (less than 10 billion cubic meters per year) for local consumption. Export projects exist, but are still in the early stages of development. For this reason the EU embargo did not apply to gas supplies. The risk of a fall in oil prices when Iranian sanctions are lifted is indeed very real. Still, the reserves of oil and petroleum products are now at high levels, and the world market is still oversupplied. According to the International Energy Agency, oversupply could still be up to 0.5 million barrels per day in 2015, although this surplus is expected to decrease or even disappear by the end of the year. However, an additional 1 million barrels per day on the market, unless offset by a decrease in production in other OPEC countries, could threaten this balancing of stocks. Over time, the world market will still get rid of oversupply and surplus stocks under the influence of growth in consumption, but the return of Iranian oil may delay this transition for another year. Meanwhile, the Russian economy has industries whose representatives may be interested in the lifting of sanctions against Tehran. Primarily, it is those that trade with Iran – exporters of grain, timber, metals, certain types of machinery and equipment, as well as importers of fruit and vegetables. The financial sanctions hinder trade and increase their costs. Alexander Kurdin is Head of Department for Strategic Studies in Energy at the Analytical Center for the Government of the Russian Federation.